Profits of China's major industrial firms maintained steady growth last year despite easing pace, the National Bureau of Statistics (NBS) said Monday. 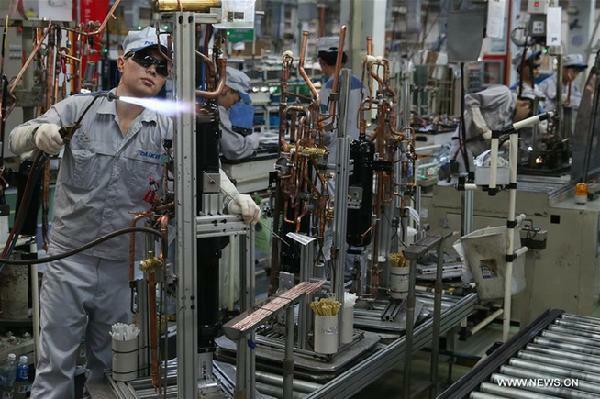 Combined profits of industrial firms with annual revenue of more than 20 million yuan (2.96 million U.S. dollars) reached 6.63514 trillion yuan last year, up 10.3 percent year on year. The slowdown in industrial profits was echoed in the easing of the producer price index -- an important barometer of industry measuring the cost of goods at the factory gate -- which rose 3.5 percent year on year in 2018, down from 6.3 percent growth in 2017. Profits in 32 of the 41 sectors surveyed rose compared with a year earlier, with upstream sectors as top performers. The mining sector's profits expanded 40.1 percent year-on-year, with the petroleum and natural gas mining subsector posting a robust growth of 440 percent. The manufacturing sector's earnings grew 8.7 percent year-on-year in 2018, slowing down from the 9.9-percent growth in the first 11 months. Among the nine sectors with shrinking profits, non-ferrous metal smelting and rolling decreased 9 percent in profits, while automobile manufacturing fell 4.7 percent year on year. The industrial sector witnessed a number of positive changes despite shrinking profits. State-owned players saw profits up 12.6 percent year-on-year in 2018, compared with 45.1-percent growth in 2017, while private firms' profit growth accelerated from 11.7 percent in 2017 to 11.9 percent last year. The profit margin edged up 0.11 percentage points compared with the previous year thanks to improving business performance. Meanwhile, the country's supply-side structural reforms helped reduce the industrial sector's leverage, according to He. The asset-liability ratio for these firms dipped 0.5 percentage points compared with the previous year to stand at 56.5 percent. SOEs in the sector reported faster deleveraging as their asset-liability ratio fell by 1.6 percentage points, according to NBS data. China will stick with supply-side structural reform to tackle major economic problems and more frequently resort to market-oriented and law-based means, the annual economic work conference held in December noted. The government has rolled out a raft of measures to cut taxes and fees for firms, especially in the private sector, with more cost-reducing steps on the way. Pan Xiangdong, chief economist with New Times Securities, expects further slowdown in industrial profit growth but improvement in the structure of profit distribution. As PPI continues to drop and the initiative to cut taxes and fees carries on, earnings of private firms in the downstream sectors will be boosted, Pan said.